The Open Championship betting tips and predictions for the 2018 event from Carnoustie. The third golf major championship of the year gets underway on Thursday 19th July. Read on for our free betting tips and preview brought to you by Racing Post Sport’s expert Golf tipster Steve Palmer. Follow him on Twitter! Cornoustie will be bone-dry following an unusually hot British summer meaning that accuracy will be key on the fast-running course. This will make it extremely difficult for players to control their ball therefore advantaging players with links experience that can avoid the pot bunkers whilst using a deft touch around the greens. Since making his comeback in the Hero World Challenge in the first week of December Tiger Woods has slowly but surely re-established himself as one of the best players in the world. This is representative of his world ranking (71) which shows his improvement from 1,199th when he made his comeback. Four of the last seven Opens have been won by a forty-something year old, it is a tournament where experience and course-management is essential. 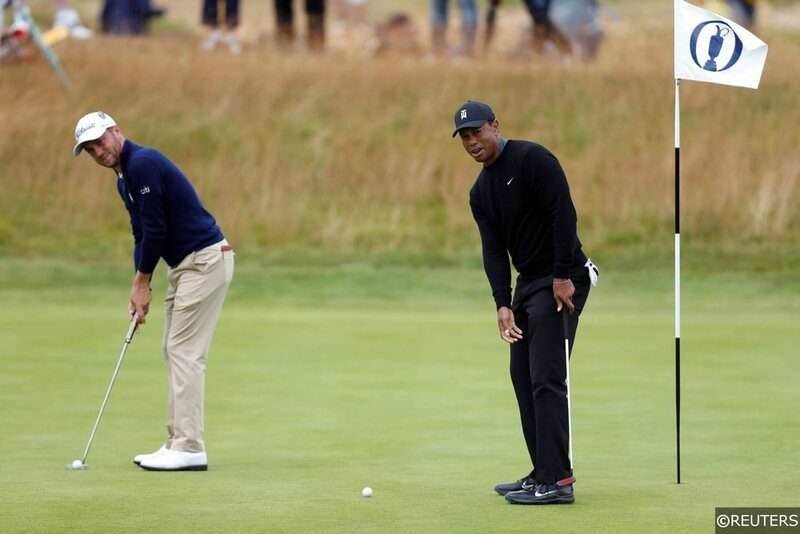 The fast and firm conditions look ideal for Woods and with his previous last two experiences of Carnoustie Opens seeing him finish 7th and 12th he definitely is capable of earning a 15th Major victory. Branden Grace loves a link challenge, he was Dunhill Links Champion in 2012 and his lone US Tour victory came in 2016 on the Harbour Town Links in the Heritage. His 6th place finish at Birkdale was his fifth top-six finish in a Major since 2015 highlighting that he is definitely ready to enter the Major league and having carded the lowest round in Major History in round three of the Open he’s showing why it would be no surprise to see him claim the Claret Jug. Six of the last eight Open champions have warmed up at the Scottish Open the week before and Matthew Fitzpatrick put together four solid rounds at Gullane last week to finish in a share of 14th place. Fitzpatrick was the low amateur in the Open in 2013, won the 2015 British Masters and carded a bogey free four under par the last time he played Carnoustie, finishing 15th in the Dunhill links. Matthew Southgate with his fifth place finish in the French Open at the start of this month showed that his game could be reaching it’s peak just in time for The British Open. A formidable record on links terrain for Southgate has seen him finish in second place in the Irish Open last year along with 12th and 6th placed finishes in the last two Opens. He has experience on this course having been a Carnoustie member for almost 14 years and having won the 2010 St Andrews Links Trophy by five shots so it would be no surprise to see him take home the Claret Jug. Forrest is a player in excellent nick that has plenty of potential and course knowledge which he’s demonstrated through finishing as the runner-up in the 2015 Amateur Championship at Carnoustie. The Scot has been playing well on the Challenge Tour this year twice finishing runner up and looks much better equipped for this years Open than the last time he qualified.